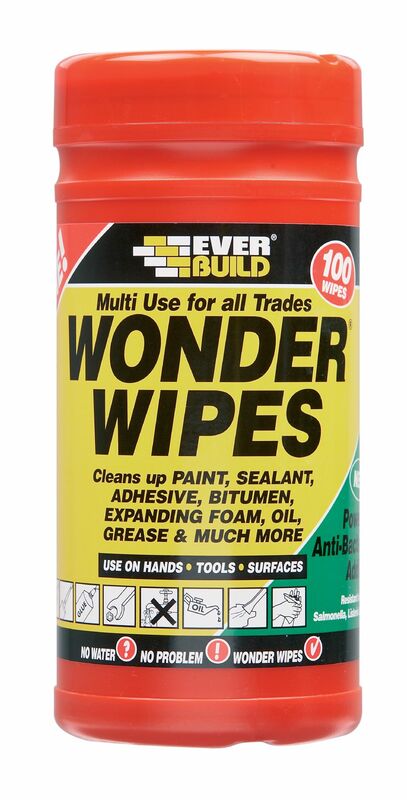 Multi-Use Wonder Wipes have become the first choice wipe of the nations builders and tradesmen. Specially formulated to clean hands, tools and surfaces from wet and semi-cured paint, sealant, adhesive, bitumen, expanding foam, oil, grease and even silicone. Particularly useful when there is no water on site. Wonder Wipes now contain a powerful Anti-bacterial Additive that is tested by an independent laboratory to BSEN 1276: 2009 and PREN 12054: 1995 - the standards for killing bacteria on dirty surfaces and hands. Wonder Wipes are active against most common bacteria found in the home and workplace.